Abenhall is on the Flaxley to Mitcheldean Road, originally a mining and iron making centre, notable for its 14th century Church of St. Michael. The Church is built of local red sandstone and has excellent contemporary carvings relating to the Forest of Dean's industries. This Church was originally built as a chapel of ease and was expanded in the 14th century to include a nave, south aisle and tower. 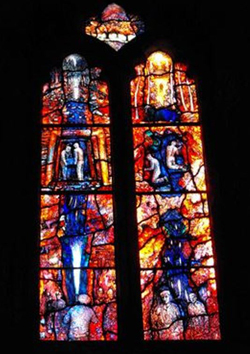 The most recent addition to the church's Stained Glass was made by Tom Denny and dedicated in 2011 by the Bishop of Tewkesbury. This 7 foot high window depicts scenes of mining and its age old links with this Church, it was kindly funded by the Freeminers Association. The top of the window depicts the surface of the earth with a coal heap illustrated and an entrance to an iron mine. Further down the window are underground scenes of traditional freemining methods. There is stained glass in the church by Bryans 1911, and fragments of good 14th century glass, possibly St. Catherine in the north chancel window. Other stained glass windows include one added to the memory of the late Herbert Fitzherbert Jones, surgeon, of Mitcheldean: in 1874. There is a dedication etched into the glass to Maud Drinkwater who was an organist at the Church (on the right hand side of the alter). Tiles on the Chancel floor have the 12 signs of the Zodiac on them, there are 6 on either side of the Altar. The chancel was renovated during Victorian times these tiles may date from that time. The original design was a circular pattern in the correct order of opposition, so would have been useful to a Priest when advising young couples about marriage. It was thought that people of opposite signs would have common interests and be more compatible. The tower at the west end of the south aisle contains 3 bells that are 30", 32" and 36" in dimension. In the chancel there is a brass with four effigies to Richard Pyrke, of Mitcheldean, b. 1609. Joan (Ayleway) his wife and their two children. The roof has been opened to disclose the timber framing and a gallery removed, at a cost of £400, and in 1879 the church was entirely restored and re-seated, and paid for by Rev. S. J. Johnson M. A. rector 1879-81. The organ chamber was added in 1883, it cost £200. Plaques dedicated to local soldiers who lost their lives in the First World War and Second World War can be seen inside, along with a list of the Vicars who have served here over the years. The mid-15th century octagonal font has tools of miners and metalworkers incised on its sides given by the miners' guild in 1450 soon after the Battle of Agincourt. The shields of prominent local families and craftsmen can be seen on the panels of the font. The Coats of arms are: The Cross of St George, Arms of Stafford Dukes of Buckingham, Device of the Free Smiths, Device of the Miners, Arms of Beauchamp's, Earls of Warwick, Arms of Abenhall and the Arms of Sargent of Longhope. There are some of the memorials inside the Church dedicated to: Joseph Lloyd Esq (d. 1842), his son Major Henry Lloyd (d.1854). Edward Hearne (d 30/09/1776 aged 74) and Sarah Hearne (d 27/07/1776 aged 80. Also John Wood (d Nov 1726 aged 46), William Wood (son d. 25/08/1723) and James Wood (son d. 25/04/1727). 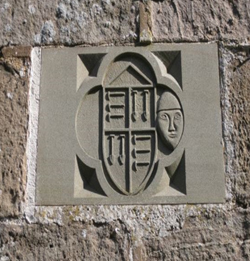 A stone shield bearing the arms of the Freeminers is set into the west wall outside the church, this is underneath the stained glass window already mentioned above. The Church has an upper and lower churchyard - the lower part had extra land given to the Church by Miss Katherine Alice Barton in 1911 for the provision of extra burial space, incidentally Miss Barton was buried there in 1912 - the first person to be buried in the lower burial area. In 1987 the churchyard was awarded second prize in the Diocesan Best Kept Churchyard competition. During this time the Churchyard was cared for by Mr Tom Roberts who spent many hours keeping the churchyard neat and tidy, a seat is dedicated to him in the upper churchyard area and a tree was planted in the Lower churchyard by his son. 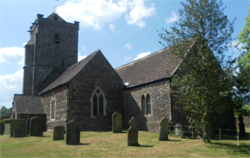 During 2012/13 in-depth research was carried out to create an up to date plan with photographs of the burials in the Lower burial ground, a copy of this can be seen at the Church by contacting the Church Warden or looking at the website run by volunteers called the Forest of Dean Family History Trust. Work is still ongoing to create a plan as accurate as possible of the upper churchyard burial plots, to assist in family history research. Our thanks to Sue Drinkwater (Roberts) for compiling this guide.